Had my thermostat replaced in the 2012 Mercedes C250. I was going to do it myself until I seen what it took to get into this thing...its a mess. Anyways, Mark was pleasant to deal with and the price was fair and everything has been running great since the fall. I cant say Ill be looking forward to going back (because who likes getting their car repaired?!) However...I do look forward to going back and getting good work at a fair price the next time any of my vehicles need work. Its great to find a small shop locally who can get the job done. Had a friend recommend this shop and Im glad I took his suggestion. Dont be fooled by the smaller older type shop- their very capable and sorted every issue that I had with my diesel sprinter van. I was pleasantly surprised when I got the bill- their very reasonably priced. Over the years Ive had all sorts of experiences from all types of shops- from dealerships to the small neighbourhood shops but this shop is great. I highly recommend this shop and will return when/if I need to. Good job guys. Great service. The owner is always there to help, and he goes above and beyond for his customers. He is honest, reliable and always keeps you informed so you never have to worry about a big unexpected bill. 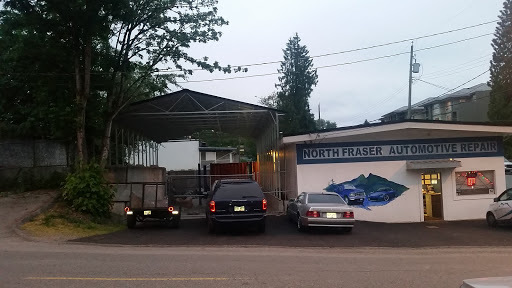 We are glad we found this place, since it can be hard to find a trustworthy mechanic that does as good of a job as they do at North Fraser Auto. Dont go anywhere else. We definitely wont. Great place to bring your vehicle to get repaired. The owner, Mark, is very knoledgable. He runs a professional business with fair rates. He is understanding to the customers needs and budget. Im not sure how many other mechabics he has working there but Mike is a great grubs well. Hard worker and very good at what he does. Great work guys! Mark Lancaster, the owner is a very caring , honest and patient person. Anyone looking for a good, reliable mechanic?..now you know where to go! He replaced my radiator at a very reasonable price. So glad I found a mechanic with integrity who genuinely cares. Took my F350 to 5 different shops and none of them could solve my IPR problem. Mark at North Fraser was able to diagnose it over the phone and had it fixed up and running good for under $300. Definitely recommended for all your vehicle needs. Great team @ North Fraser. Knowledgeable, Superb work, on time Will be back for any future auto repair! So good to have an honest mechanic.